"Country air. Ah!" Bonnie said, taking a deep breath. "I can smell the rich brown earth, the grains growing in the plowed fields and a hint of pine from the forests carpeting the hillsides. I love the country!" "This is beautiful country. I like this time of year too. Late summer, when all the leaves are beginning to fall, birds are flying south and the heat is gone," Bruce added. 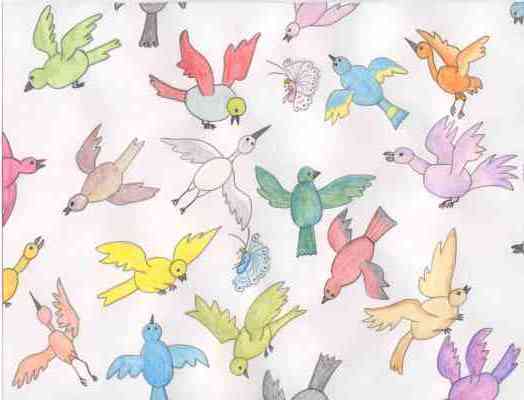 They fluttered along through the sky, zooming in and out of the low flying clouds. "Look at that tree," Bonnie pointed out. "It’s filled with colors, yet there are no leaves. How odd!" "Why don’t we go and see what it is? I’m needing a rest anyway," Bruce said. They flew down towards the tree. "Uh oh. It’s not flowers or fruit growing on those bare branches. It’s birds! I didn’t know Scotland had birds that were so colorful, and there are so many of them in the same place. That’s very odd," Bonnie said. "We’d better be really careful. Let’s get out of here before they see us. Birds, especially colorful ones, love to eat butterflies," Bruce warned. They flew quietly past the tree. 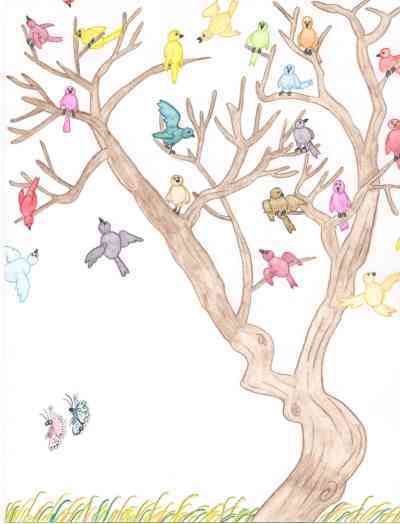 Just as they began to feel safe, the birds flew off the tree and headed towards them. They soon surrounded Bonnie and Bruce, knocking them here and there. "Bonnie, where are you?" Bruce called out, not seeing his friend. "Over here," she cried. "Where are you?" Bruce never got to answer. His wing got caught in one of the bird’s feet and he soon found himself being carried off. "Help!" he called out, but Bonnie didn’t hear him. Within a few minutes the birds were gone. Bonnie fluttered down to a tree stump and rested. "Now, where did Bruce go?" she wondered. She looked all around. "Bruce! Bruce! Bruce!" she called. He didn’t answer. She looked in the sky and saw the birds heading west. "I wonder if one of the birds caught Bruce? I’d better follow them." She flapped her wings as fast as she could and chased the birds. After a while she came to a town. A large sign announced its name, Kirriemuir. "What a lovely little town," she said, flying down the narrow streets. "Look at all the red buildings. I like that color of brick." She called Bruce’s name over and over again but he didn’t answer. "Bruce! Bruce! Bruce!" The bird dropped Bruce on the ground, at the bottom of a statue. He rubbed his sore wings and straightened his bent antenna. "Where am I and what is this statue?" he asked. He flew up and down and around the statue. "Oh, it’s Peter Pan! I must be in Kirriemuir. I wish Bonnie was here to see this statue," Bruce sighed. "Bruce! There you are," Bonnie called out. She flew down to the ground next to him. "Where have you been? I’ve been looking all over this town for you." "The bird dropped me here. My wing was caught in his foot." Not worrying about the previous event, he said, "Look at this wonderful statue. It’s Peter Pan. J.M. Barrie, who wrote the story, was born here. Do you know the story?" "Yes, of course. Everyone knows who Peter Pan is, silly," Bonnie assured him. "There’s Wendy and Captain Hook, the pirate, and Smee, and John, and Michael, and the Lost Boys too. I know the story well." "This is a nice village," Bruce said, looking around. "J.M. Barrie is buried here too. Maybe if we have time we can go and have a look at things." Bonnie nodded in agreement. "Oh," he said, spotting the colorful birds on top of a shop. "There are those birds again. Where in the world did they come from and why haven’t they flown south, like the other birds are doing?" "Don’t worry about it. Let’s go and see what we can find to eat. I’m rather famished," Bonnie said, rubbing her tummy. They flew up one of the narrow streets, looking for a flower garden. On one of the shop windows was a large poster. "What’s that?" "The big sign. It looks like it has birds on it," she said, fluttering down to read it. "Oh, those birds escaped from a pet store. The owner is looking for them." She looked up and saw they were in front of the pet store. "We need to help him find his birds before they all fly away." They flew into the store and fluttered about in front of the owner. "What are you butterflies doing in my shop?" he asked, smiling at them. "You’re very pretty and colorful, just like my wee birdies." His smiled changed to a sad frown. "They’re lost." Bonnie fluttered her wings and headed to the door. Bruce followed. The man sensed they were trying to show him something. "Do you want me to follow you? Do you know where my birdies are?" he asked them, excitedly. Bonnie fluttered her wings faster. He opened the door and the butterflies flew out. They hovered until he locked the shop up. "Take me to them," he said. Bonnie and Bruce flew down the lane. Suddenly the man saw his birds. "Oh, there you are. Come to papa," he called to them. The birds flew from the rooftop and zoomed past Bonnie and Bruce, knocking them about again. "Oh no! Not this again," sighed Bruce. Bonnie was knocked to the ground and the pet shop owner nearly stepped on her. The birds landed all over him. He had them on his head, arms, shoulders, chest and back. "I’ve got my birdies back." He laughed and walked towards his shop. Bonnie stood up and brushed the dirt off her. "That was a close call!" Bruce joined her. "I nearly had my wings crushed right in half! At least he’s got his birds back. Let’s go to the pet shop and see." When they arrived at the pet shop, they looked in the windows. The big sign was down and all the birds were back in their cages. The owner came outside when he saw the butterflies. "I’ve got a lovely garden behind the shop. Come on and you can help yourself to all the nectar you want," he said to them. He opened the front door and let them in. They flew past the caged birds; all were chirping merrily away now. He opened the back door and they flew into his back garden. It was filled with roses and asters, bluebells and marigolds. "There you are now and thank you for finding my birdies. Stay as long as you want." He went back inside and shut the door. "Ah. Look at this sweet nectar. I guess being kind does have its benefits, doesn’t it?" Bruce said. Bonnie didn’t answer. She was too busy sipping nectar from a white rose. Bruce smiled and fluttered up next to her. They spent the rest of the day surrounded by the beauty of the flower garden.